This blog was created with the intention of clarifying common misconceptions and mistakes, as well as to discuss the qualities of Russian armoured fighting vehicles. Each article is intended to be a comprehensive overview for each AFV in terms of mechanical detail and combat capabilities. We try to make sure that the information used is absolutely reliable, but there will always be some mistake hidden away somewhere. To improve the quality of the blog, please do not hesitate to point them out. Share your thoughts on this in the comments section of my articles and in the regularly updated polls. I will always respond to comments, even if I am no longer posting. Love your posts and can't wait to hear about the SPRUT-SD and the undersung BRDM-2, have you thought of making a post on T-64? There's so little on that tank and I'd love to see a look into it the likes of your T-72 post! First of all - Sorry for the late reply! Yes, my partner, Miguel Miranda, is currently working diligently on a Sprut-SD article, and the BRDM-2 article is also underway, though it is not on top of my priority list at the moment. Right now, I am concentrating on a series of short articles, dubbed "Field Disassembly". We will be "disassembling" the T-90A and BMP-1. We also have a T-54 article in the works, though not a T-64 article at the moment. There are so many similarities between the "T-tank Triad" (T-64, T-72, T-80) that I find it difficult to justify another new article for the T-64, especially since the technology of the T-64 is largely duplicated in the T-72 Ural. The T-64 was a real brakthrough but there are few details about its 5TDF diesel engine of opposed pistons quite similar al Leyland L-600 of the British Chieftain. I would like to know if you have information about this engine developed by Professor Charomsky. I Praise the quality of your articles, specially concerned about optical equipment and weapon stabilization. I can't wait to hear about the BRDM-2 and the Sprut-SD. Love your posts. Easily the best source of information on Soviet and Russian vehicles I've ever come across. Can't thank you enough for your effort! It's been a while, any update on when your next article will be posted? Sorry about the atrocious delay, John. "T-54: Red Dawn" will be the next article, and it will be posted within the week. It is similar in length to the T-72 article. Nothing to apologize for, your articles are worth the wait! What would you like to see next? I've got articles on the BTR-60, BTR-82A, PT-76, Sprut-SD and the BMP-1 on the way. Hey man! Keep them coming, I've read all of them so far. Excellent stuff. I also have friend who read your articles, we all love them. Personally, I'm a big fan of the BMP-1. Excellent work. In your future articles could you also include comments on the qualitative differences between the so called 'monkey models' and the models used by the Russian/Soviet Army. Thanks. I think that I have devoted a few passing remarks on the topic periodically, but to make it clear here: "Monkey models" do not exist in the strictest sense. Export models were definitely downgraded, but there is no proof so far that mild steel was used for armour, that the sights were fitted haphazardly, or what have you. However, exported tanks were severely downgraded by not having the latest ammunition, and not having the latest model. Given the rapid pace of the advancement of arms technology during the Cold War, using stuff that is decades older than what your opponent has is a clear disadvantage. BUT, the "downgrade" was not so drastic. The biggest problem with foreign operators of Soviet equipment is that they often lack the finesse to operate them. Vietnam is an example of a reasonably competent wielder of Soviet steel, but their inability to control or at least influence the air traffic greatly contributed to the loss of many of their armoured assets. More of this will be expanded upon in the upcoming T-54 article, which should come out today. Dude the T-54 article was outstanding! 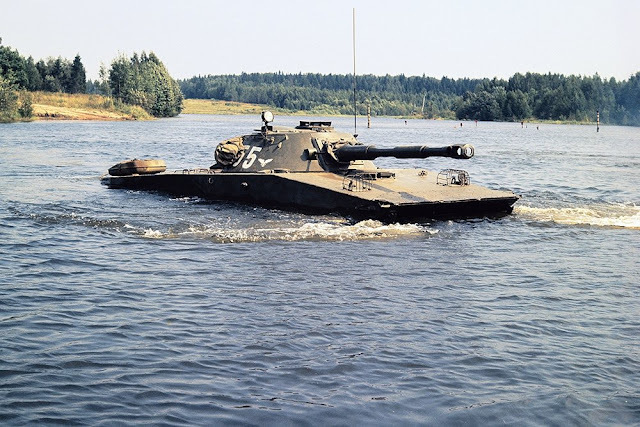 Can't wait for the BMP-1 article since its such a classic vehicle and the father of modern IFVs. Great job on the T-54. Definitely an underrated tank! Do you plan on adding some text on a few sections that were not discussed in detail (such as the BDD armor)? Well, the BDD armour on the T-54 is practically the same as in the T-62, and I've already covered it on the T-62 article. I've added a link in the BDD section of the T-54 article to that end. What are the full frontal arc protection stats of a T-62 and T-55 with BDD amour? and what is the max they can stop? Thanks in advance! Well, it depends. The Hungarians did a test with a decommissioned T-54 by putting some BDD armour on it, taken from a T-55. They shot at it with a Fagot missile from the side. It went through, and the cumulative jet was stopped by the gun breech. They don't tell us how deep it went into the breech, or where it was exactly that the missile hit, but we know that the side of the turret of a T-54 is 120mm thick on average, and that the Fagot can penetrate 400mm RHA. Therefore, the front of the turret should be able to stop the missile, because it's got an extra 80mm. BDD armour on itself has a very limited effectiveness. It should be able to stop anything hitting the front of the tank it's mounted to as long as what's hitting it has a shaped charge that does less than 400mm of penetration. In other words, it's good for LAW rockets (and its Soviet copies), older RPG-7 rockets, M47 Dragon missiles, and anything to that effect, but nothing more. Tankograd! Whats the next article going to be man? I'm not sure. I work on a few articles at a time, and the one that gets finished first depends on my own personal interest and reader requests. Right now, I'm working on articles for the BMP-1, PT-76, BRDM-1, BTR-82A, BTR-60 and T-64 (115mm gun). Which one do you want to see first? Duly noted. I will be writing the article in the "Field Disassembly" format, where I cover all of the unique aspects of the vehicle in full detail as usual, but I gloss over the parts that are shared with a sister design. In the case of the BMP-1, I will only be examining the turret and some small layout differences between it and the BMP-2. The chassis, engine, transmission, steering system, fuel system, and so on, are all either identical or largely the same. Ah, of course. I would be immensely surprised if Cuba had the financial resources to replace their old tanks, even if they wanted to. Cuba used to have a significant international presence. I have no idea how powerful they used to be, but they starred in Red Dawn alongside the Russians as equals, not as subordinates. I always found it strange that they portrayed Cuba as a nation powerful enough to invade the U.S.A. Now they don't have much influence, so I cannot envision what they might use their tanks for if they decided to upgrade to new ones, so I suppose that it's for the best that they keep their old ones. Less upkeep and all. Am guessing now cuba is just to outdated and look at their gear is all old as hell. I think their newest tank is the T-72 and they only have a couple. Yes, and that is exactly why I made the point that the T-54 cannot be considered a subpar tank. It performed very well in the right hands. The Cubans really knew their stuff, it seems. Brother I love your articles are outstanding. What is the next article on? The BMP-1 got the most votes, so it'll be next. Stay tuned! Will there be a T-64 or T-90 article any time soon? I had some interest in the original T-64 (with the 115mm cannon) initially, and I've got a draft for a T-90 article that is 20% complete at this point, but right now, I have absolutely 0 motivation to write any more articles for Tankograd. I'm afraid that you'll have to make do with the material that I've put out so far. Real life affairs are at the top of my priority list, and Tankograd is at the bottom. Thanks for all your work! ! Good luck with The real Life! My email is at the bottom of the page. It's irondrapes@gmail.com. Please do contact me! Just wanted to say that your blog is excellent. Pretty much the best source of info on Soviet / Russian armor on the web, bar none. Hope your real life issues are going well and one day you'll be posting again. All I can do is repeat what others have said. These articles are without compare, period. I'd love to see more when you have time. But in the meantime, best wishes. I just recently came upon this site. I agree, excellent work! You cover all the aspects, including ammunition for said vehicles. Thank you also for quickly responding to the questions I posted recently. Hopefully life treats you a little better these days. Do know that your contributions are appreciated by all us. If you do decide to add to the page, my vote is for BRDM-2. hello friend im the guy who asked about the T90A armor. i personally do not really think we can just yet say that the armor in the T90A is similar to the T72B because no info is there , apart from a brochure with an illustration that kinda looks like reflective sheet layout , but doesnt speak about the composition. as for the other question , people sometimes say that the T90M for example has mediocre armor compared to the abrams M1A2 SEP , how true can this be ? do we have RHAe values ? and is the safe ammo placement on the abrams really that much of a giant advantage ? ps : out of curiosity , what is your favourite tank? Yes, precisely. Nothing can be said about the composition right now, although the layout appears to be the same as the T-72B turret based on available evidence. There is not enough information about the T-90M or the M1A2 SEP, so I'm not going to give any comment here. Let's just put it this way: both are fully capable of fulfilling their roles. Safe ammo placement in the Abrams is a significant advantage in asymmetric warfare. The ammo in any tank will be safe if its armour doesn't get penetrated, and practically all modern tanks can easily resist an RPG-7 from the front so all modern tanks are equally safe in that respect, but in Chechnya, the majority of hits sustained by Russian T-72 and T-80 tanks landed on the sides, rear, and some landed on the roof. Barring some lucky non-penetrations, separated ammo with blow-out panels will be infinitely safer than any other method of ammo stowage. My favourite tank is the T-62. alrighty so the so called ''nato tank technology superiority " isn't what it's cracked up to be given the lack of evidence . T-62 , first tenk with smoothboi :-D.
one more thing : russians said that the armor is worth up to 1100 mm vs KE , and that the next tier of defence , the cabsule , is worth 900 mm , if you stack this with that , *AND* with the malkhit ERA , wouldnt that be way too much? I didn't say anything close to that. I think that there are many examples of NATO tank technology having a lead over current Russian technology. The biggest shortcoming of Russian tanks right now is the lackluster thermal imaging equipment and the shortage of funds, forcing the current fleet of T-72B3s to rely on outdated Kontakt-5 instead of something more modern. Nobody said anything about 1100mm vs KE or 900mm vs KE. All these random numbers on the internet are basically meaningless. Hi! I think there might be a bit of an issue with the hyperlink on the homepage for the BMD-2 article; the link there routes to an error page while the link to the same article in the drop-down menu to the side works fine. Idk if I'm missing something or if it's just a problem on my end but I thought that I'd mention it anyway. Yes, there was a mismatch in the hyperlink. I've fixed it now. Thanks for pointing it out.